An array of entertaining events will take place across Viet Nam from May 9-25 during Europe Days 2014, the EU Delegation to Viet Nam has announced. 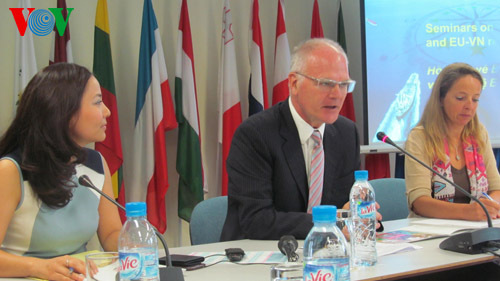 According to Franz Jessen, Head of the EU Delegation in Hanoi, the event, the 10th of its kind in Viet Nam, provides an opportunity for Vietnamese people to experience a wealth of European culture. The festival will open in Hanoi on May 9 with a live Jazz performance by outstanding German artist Bavaria, under the baton of Harald Ruschenbaum. The musicians will then travel on to Ho Chi Minh City to give another performance on May 11. The talented violinist Alicja Smietana from Poland will also take to the stage in Hanoi, on May 28. The annual European Film Festival will showcase 14 award winning movies in Hanoi, Danang and HCM City on May 16-17-18, respectively. A short film by a promising, young, Vietnamese director will also be screened as part of the event. The festival will include a photo exhibition on Hanoi and a short film competition themed energy conservation. On the sidelines of the event will be a number of seminars on European culture and the importance of Viet Nam-EU relations in Hanoi and HCM City.